No more boring math lessons! With the colorful, award-winning Horizons 1st Grade Math Set, your child will learn elementary math concepts in a teacher-guided, interactive format. Stop dreading math lessons! Picture your child enjoying math and finishing assignments in addition and subtraction, multiplication, and decimals with the colorful, best-selling Horizons 2nd Grade Math Set. Highly acclaimed, this proven math course includes 160 lessons within two student workbooks and a two-part teacher's guide. 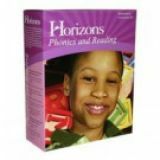 Strengthen your student's reading skills with the Horizons 2nd Grade Phonics & Reading Set from Alpha Omega Publications. Two student workbooks contain 160 fun-filled lessons and activities that enhance your child's mastery of phonics, spelling rules, and vocabulary. Teacher's guide and two student readers included. Does your child know how to read roman numerals, convert measurements, find place values to the billions, and solve simple story problems? With the Horizons 4th Grade Math Set, he'll learn all that and more! This complete Alpha Omega curriculum math course includes 160 colorful, lessons within two student workbooks and a teacher's guide. Want your child to learn math using real-life illustrations? With the Horizons 5th Grade Math Set, you'll reinforce new math concepts with fun-filled, homeschooling activities. Two colorful student workbooks in this Alpha Omega curriculum contain 160 lessons covering problem solving, percents, averages, and more! Teacher's guide also included. Expand your student's math skills with the Horizons 6th Grade Math Set. Building on previous math concepts, this best-selling Alpha Omega curriculum strengthens your child's skills with advanced math lessons on percents, geometry, personal finance, and more! Two student workbooks with 160 colorful lessons and teacher's guide included. Give your child a smooth transition into advanced math with the Horizons Pre-Algebra Set! This popular Alpha Omega curriculum builds on basic math operations with hands-on lessons in basic algebra, trigonometry, geometry, and real-life applications. The set includes a full-color student workbook with 160 engaging lessons, a user-friendly teacher's guide, and a separate tests and resources book for evaluating student progress. Explore math through sports and other real-life applications with Horizons Algebra I! Divided into 160 lessons, this fun course includes a colorful student workbook, a tests and resources book, and a teacher's guide packed with tips and hands-on activities to make algebraic concepts easy to learn. Topics covered include exponents and powers, absolute value, radical expressions, multiplying and dividing monomials and polynomials, the Foil Method, and factoring trinomials, as well as solving, writing, and graphing linear equations. Plus, practice problem sets prepare your student for standardized math testing. Give your child a solid foundation in mathematics with the award-winning Horizons Kindergarten Math Set! Filled with 160 attention-grabbing lessons, this easy-to-use Alpha Omega curriculum includes two colorfully illustrated student books covering adding, subtracting, and more; plus a helpful teacher's guide with daily lesson plans, answer keys, and worksheets. Teach your child solid reading skills with this hands-on course that covers the fundamentals of phonetics in an engaging workbook format. The Horizons Kindergarten Phonics and Reading Set includes four student workbooks, four teacher's guides, four brightly illustrated readers, an alphabet floor puzzle, and a wipe-off tablet.